No matter what category you are shopping in this year, we have worked very hard to give you the selection and prices that you need! Learn about our selection of all of the top holiday categories! Sims Music was started in 1979 as a small guitar shop and has grown to stock hundreds of guitars! Because the electric guitar is in our roots, we work very hard to provide a selection of the best brands and models possible, for all ages and all skill levels. Every guitar purchased from Sims comes completely setup by our technician, included with lifetime neck adjustments for free, picks, polish cloth, and even a t shirt! Whether you are looking to get a beginner guitar for your young future rock star or maybe you have decided later in life to start playing, we've got some amazing options for you. Or maybe you have a loved one who is looking for their dream guitar? If so, we've got an incredible selection of top brands such as Taylor, Martin, and Gibson! Also, just like our electrics, all of our acoustics come completely setup by our technician, included with lifetime neck adjustments for free, picks, polish cloth, and with a t shirt! Sims may have started as a guitar shop but do not be fooled! With Jerry Sims' son, Justin, being a drummer, we have worked hard to become the top drums and percussion department in the Carolinas! 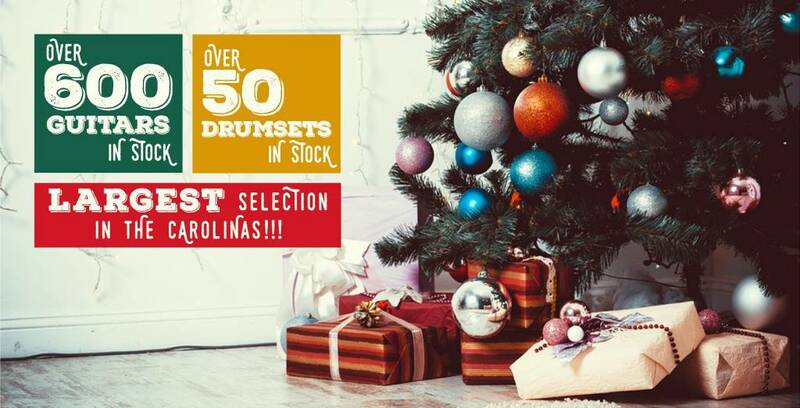 With over 50 drumsets, 250 cymbals, and a wide variety of accessories, we've got great options for any drummer at any skill level! We also have 3 drummers working in the shop right now with tons of knowledge so feel free to come by or give us a call and let us help figure out the best gift for your loved ones (or yourself!). The keyboard world is about as hot as its ever been! Whether its the influence of famous artists, the great products coming out from the manufacturers, or just a new movement in today's youth, we are seeing tons of excitement in our keyboard department! We've stocked up this year with a wide variety of portable keyboards for someone showing an interest in playing and digital pianos for someone looking for the feel of a piano without the size and expense. And if you are looking for a pro level board to play in church or with your band, there are tons of great options at great prices out right now, and we've got them all in stock! A guitar player can never have enough pedals! Over the last few years, guitar players have been taking advantage of new technology and are pushing the limits on the sound of their guitars and their tone! We have seen this passion in our local players and have worked very hard to make sure we have the best pedal selection around! From great brands like Strymon, JHS, and Wampler to the classics like Boss and local legends like Caroline, we've got a great selection and can help you find the perfect addition to your sound!